Please note that this will not be updated to support concrete 5.7. 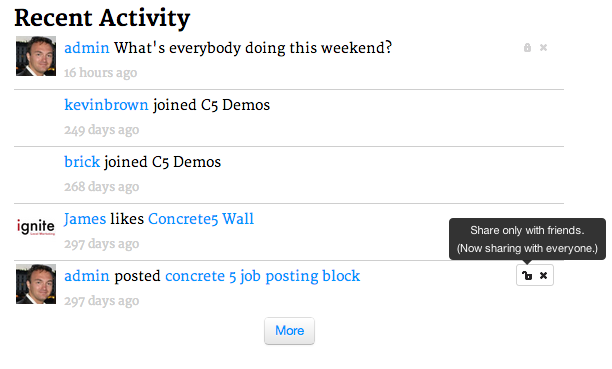 The Concrete Wall provides an activity feed block for concrete5. This block shows "posts" that have been created due to various things that happen on your site. Think Facebook -- there's a list of things that have happened that are attached to pages (including people) and that are shown across pages. Use this add-on to make your site more interactive and social. The wall feed demonstrates that your site is active, that other users are doing things, and provides a quick overview of fresh content. 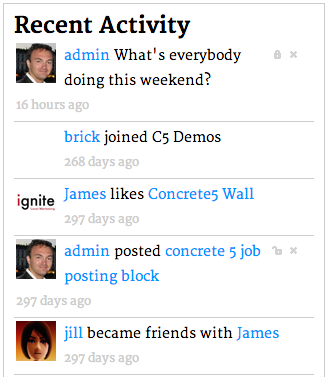 At its core, the Concrete Wall is a block that provides a listing of posts, filtered by various criteria (the logged-in user, the page the block is on, etc). Posts are added from other areas of your concrete5 installation -- other add-ons, the core, and/or your own custom code -- through a very simple API. 1st person & 3rd person sharing - [James] What's everybody doing this weekend? After a posting type has been added, the post is really just some data that fits into the template and describes what object the post refers to. N.B. : It is dependent upon you or your package's developer to "post" activities, other than those listed above or below, to the wall. Packages that support the wall will add new posting types and post data as applicable. 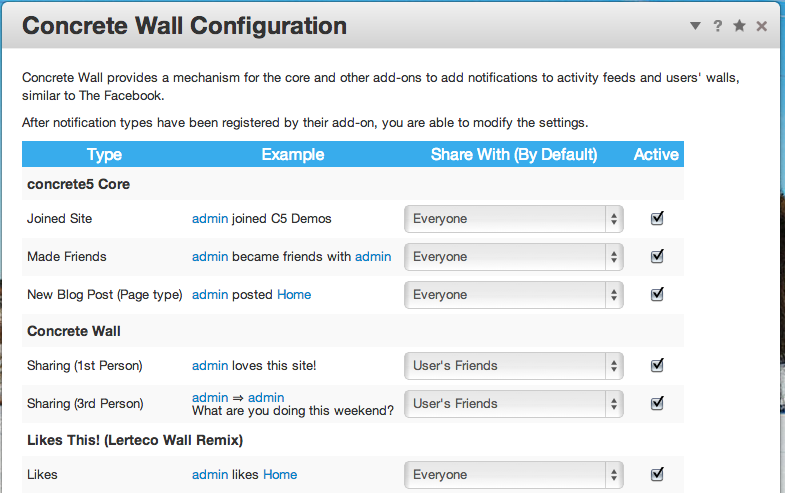 If your add-on supports Concrete Wall, message me and I'll add it to the list.